Once upon a time, a young man called Edward was walking along and he came across a synthesiser. "My, what a curious device" he thought to himself, as he absent-mindedly pressed the keys. Edward was so pleased with that sound that he decided from then on, he would dedicate his spare time to meeting as many synthesisers as he could. wonderful creatures that they are. A little while later, Edward met Julian, and they got to talking about music. Julian wasn’t really into synthesisers, thinking that they were very limited and made bad sound-alike noises. He much preferred to (badly) play the guitar, because he had direct control over the strings as they vibrated. "AHA!" said Edward, well I have some synthesisers you should meet. And took Julian back to his studio, where he showed Julian what an analogue synth with lots of sliders, instead of a few buttons and an LCD menu let you do. Julian was also so pleased with the sounds and control that he decided he would also dedicate his spare time to meeting as many synthesisers as he could, wonderful creatures that they are, and help them say what they want to say. 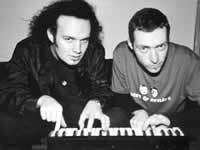 And Edward, Julian, and the synthesisers all lived happily ever after.